EU Ambassador Jernej Videtic looks on as Public Security Minister, Khemraj Ramjattan signs the EU Seaport Cooperation (SEACOP) Programme agreement. Public Security Minister, Khemraj Ramjattan on Wednesday countered claims that there has been an increase in violent crime, saying that Guyanese are more confident in reporting incidents. He was at the time speaking at the signing of a 3 million Euro agreement between the Guyana government and the European for the Seaport Cooperation Programme (SEACOP) that seeks to equip Guyanese to crackdown on maritime offences such as drug trafficking. The Public Security Minister said persons are upset this administration is doing a better job. “Some people don’t like that, especially in the context of catching more criminals now.” Ramjattan said some 300 persons have already received training overseas since the APNU+AFC coalition took office last year May. Minister Ramjattan is urging more citizens to speak out against rogue cops. “Massive amounts of drugs, cocaine, meth, and cannibis sativa have this appealing effect on even law enforcement officers getting corrupt,” Minister Ramjattan said about the number of former police officers reported in the press as being involved in criminal activities. The Public Security Minister said he has taken notice of the murder of a Berbice carpenter for which the mastermind, US-based guyanese Marcus Bisram, behind that homicide is now wanted by Interpol for not only allegedly paying to have the carpenter murdered but also being accused of paying officers at the Skeldon Police Station to corrupt the file. There were allegations that Bisram also attempted to bribe the family. The Minister expressed a need for more scrutinising of investigations. The Seaport Cooperation Programme which will run until December 2018, is aimed at training and equipping inter-agency units to identify, search and interdict all forms of maritime trafficking. Four candidates from Guyana are nominated for maritime intelligence training, and nine other officers will be pursuing a vessel searching course under the project. Ramjattan said Skeldon is a community with a history stemming back to the 1980s when products like sardine and potatoes were banned and which resulted in a reliance on contraband and corruption officials. Guyana is now part of 26 other countries in Africa, Latin America and the Caribbean which have signed on to the SEACOP programme. As part of the project, the United Kingdom will provide an advisor to the Ministry of the Presidency from January 2017. 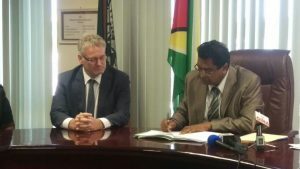 EU Ambassador Jernej Videtic said the Guyana partnership in the initiative would have a global impact since Guyana is seen as a trans-shipment point for narcotics.